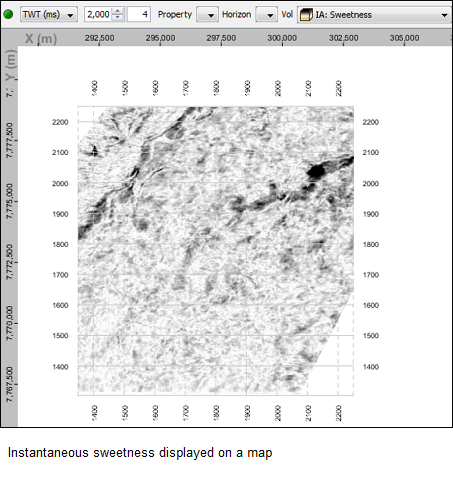 Description Calculate instantaneous attributes for a seismic volume: envelope, instantaneous frequency, instantaneous phase, and sweetness. This process calculate instantaneous attributes for a seismic volume: envelope, instantaneous frequency, instantaneous phase, and sweetness. It converts the real-valued input traces to complex-valued traces based on the Hilbert transform. The output of this process includes the instantaneous attributes of amplitude ("waveform envelope" or absolute value of the analytic signal), phase (the argument of the complex-valued trace), frequency (the scaled time derivative of the instantaneous phase) and sweetness (instantaneous amplitude divided by the square root of instantaneous frequency). In the Details Panel at Input Volume, select the volume from which you want to generate the instantaneous attributes. Both 2D and 3D volumes are supported by the process. Amplitude — Select this check box to generate the instantaneous amplitude attribute. This attribute represents the "waveform envelope" or absolute value of the analytic signal. In the Volume tab, the amplitude instantaneous attribute volume is added to the list. Phase — Select this check box to generate the instantaneous phase attribute. This attribute is represented in wrapped form between -180° and 180°. In the Volume tab, the phase instantaneous attribute volume is added to the list. Frequency — Select this check box to generate the instantaneous frequency attribute. This attribute is calculated from the time derivative of the unwrapped phase, and takes values from 0 Hz to the Nyquist frequency of the input volume. In the Volume tab, the frequency instantaneous attribute volume is added to the list. As instantaneous frequency can get very close to zero, you can define a minimum value to clip the frequencies at Frequency clip (Hz). By default, this is set to 1Hz. In the Volume tab, the sweetness instantaneous attribute volume is added to the list. 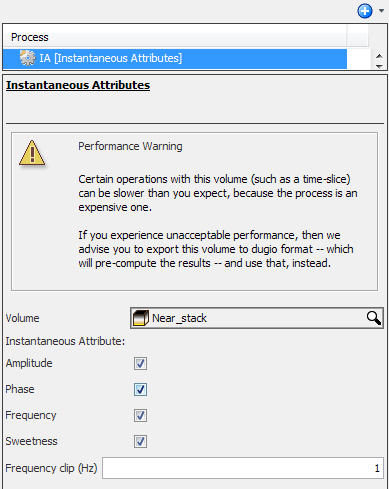 Performance warning: Instantaneous Attributes is a computationally-intensive process, thus the resulting output volume will be very slow to use. If you find that it is taking too long to do anything with the output volume, we recommend exporting the output volume to dugio format (see Exporting a Volume to DUG I/O) and using that instead.